My students will tell you that I am a massive Star Trek fan; in fact, I have most of the episodes of all of the series on VHS tapes or DVDs. A number of years ago, an episode of The Next Generation featured Data trying to learn what humor is. He went to the holodeck and asked the computer who the funniest stand-up comedian of all time was, and got the answer that it was a 21st century comedian whose subject was quantum mechanics. This intrigued me. Could one actually make a good stand-up routine about quantum mechanics? While teaching at Provo Canyon School, my students weren’t able to do most standard chemistry labs due to the circumstances, so I taught a course that was more theoretical. For an extra credit question on our test on quantum mechanics and atomic physics, I asked them to come up with a joke or pun that involved terms and ideas from these subjects. The students took more time on that one question than all the rest of the test combined, and the results eventually mutated into a stand-up routine by a cartoon character called Boson the Clown. I’ve described him in a previous post (The Atomic Comic Club). Why did the electron cross the road? He never did – because he was quantized, he was already on both sides at once but never in the road. In a box is where he hid. The vet at the particle zoo had a problem with beryllium. He only had two options – to curium or to barium. He had a dentist to boron the beryllium’s tooth. I’d give a nickel to see what happened when the beryllium woke up; now the vet and the dentist argon. Did one particle in the particle accelerator like the other? Yes, they had a “smashing” good time! An electron walks into a bar and the bartender says, “Why so negative?” The electron says, “My girlfriend just met this photon and moved out on me.” The bartender says, “Well, that’s too bad. But do you see that young particle over there? She’s dying to interact with you.” The electron thinks, “Maybe this is my lucky day!” and swaggers over to meet her. He asks her name. “Positron,” she says. “Nice to meet you!” he says and shakes her hand. Boom! It was annihilating love at first sight. Now they have a bunch of baby quarks. Some of them are actually pretty good as jokes and even better as evidence of an understanding of atomic physics. We are now studying quantum mechanics and I have prepared a Keynote/Powerpoint presentation on quantum numbers and electron configurations. I am including it here in case anyone out there could use it; please feel free to make use of it however you like, just give me credit (consider this to have a Creative Commons 3.0 Attribution Only license). I’m struck, as always, by our inability as humans to adequately visualize subatomic properties. 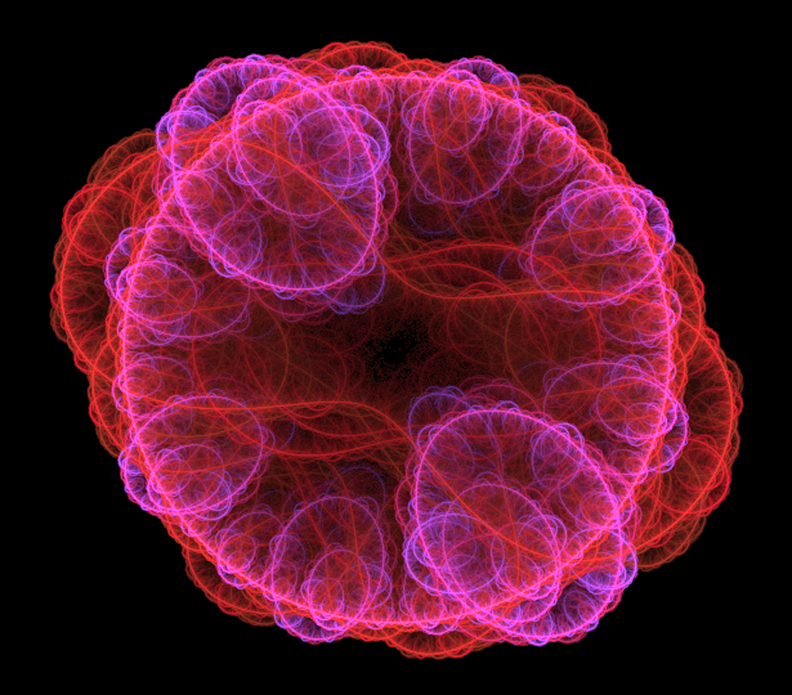 We think of these “objects” inside the atom as either being particles (like small, hard balls) or as waves, constantly in motion. Our models are the solar system of planets orbiting in nearly circular orbits around the Sun, and waves of water in the ocean producing a nice sin wave pattern as they wash up on a beach. It turns out both of these models are partially true; subatomic particles sometimes behave as particles (as in Einstein’s paper on the photoelectric effect) and sometimes as waves (such as Louis de Broglie’s experiments). The truth is, subatomic particles are really neither of these things – they are what they are, but we have a hard time coming up with models that describe them well. 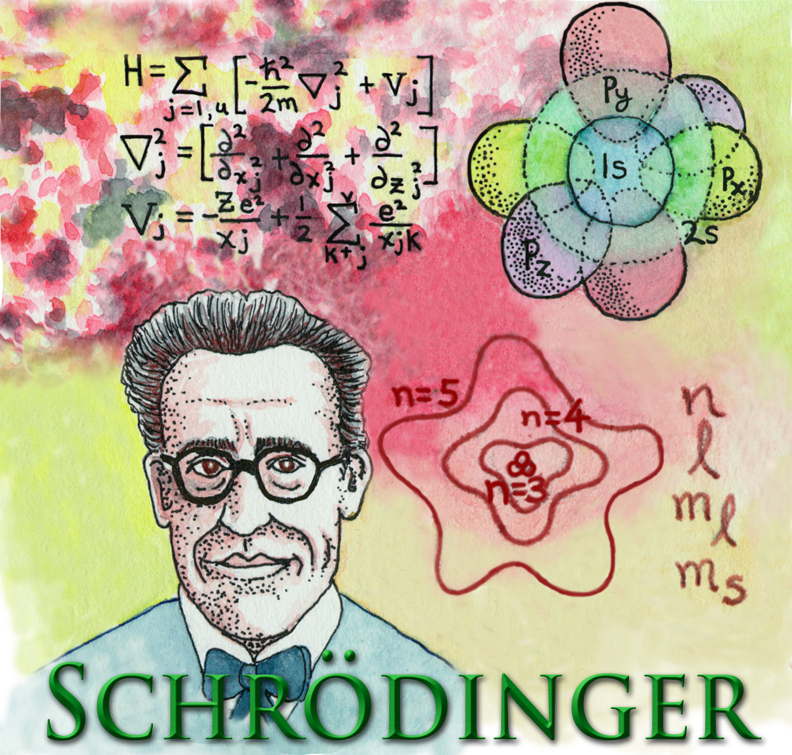 On the other hand, the quantum mechanical equations of Schrödinger, Heisenberg, and others describe the electrons so perfectly that we can create such amazing devices as Magnetic Resonance Imagers and iPads. The mathematics is very accurate; our visual models are the only things that need work. I like to think of electrons as standing wave patterns. 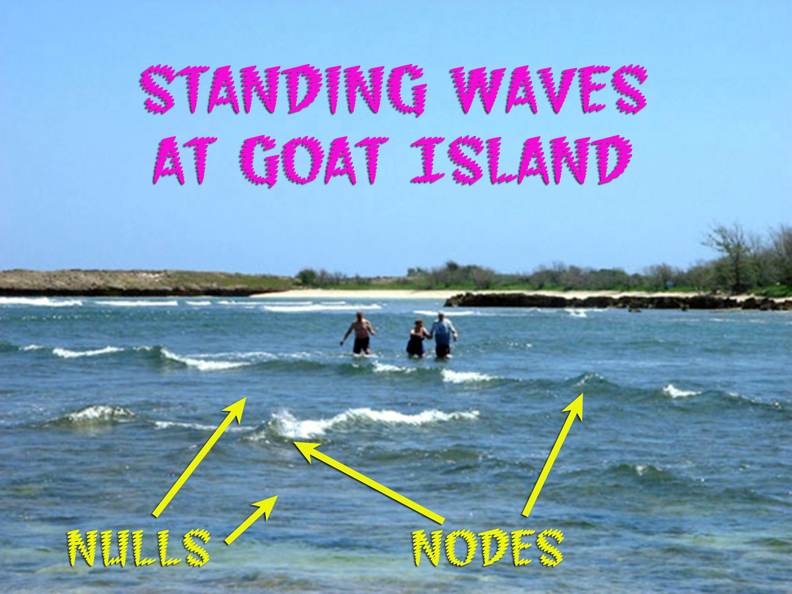 The example I give my students is the waves near Goat Island, Hawaii. This is a small island located just off shore to the northeast of Oahu. 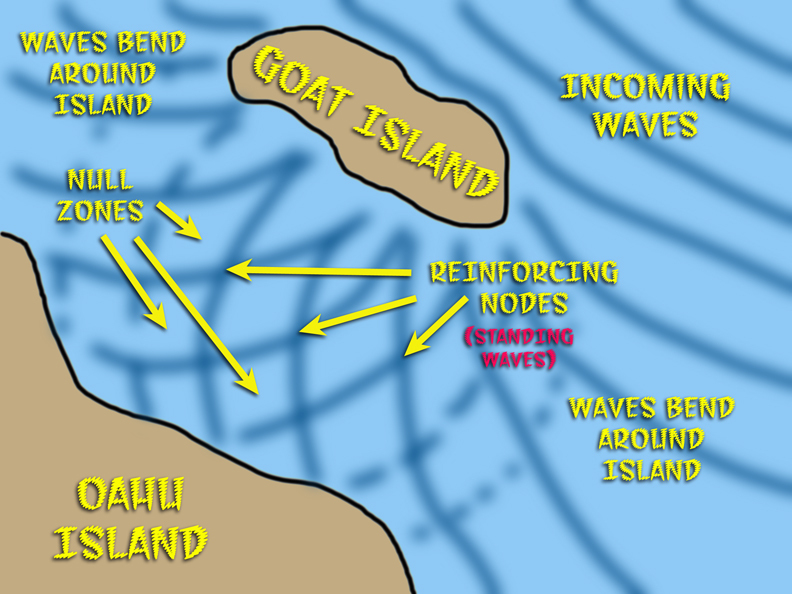 As waves break around the island, they are bent in two directions as they pass between the islands, coming in at about 90 degree angles. As they meet, the crests of the waves reinforce each other to create large humps at regular intervals. These are standing waves that slowly move toward shore. You can actually float on top of them and ride them for a few seconds. Between these humps, there are no waves at all and the water is very calm where the waves interfere with each other and cancel each other out. According to the quantum numbers, electrons are standing waves as well with only certain energy combinations that are stable (where the waves add up). This is why the principle quantum number n is always a positive integer; any non-integer solution tends to cancel itself out, like a wavelength of 3.5 bent around the nucleus would completely interfere with itself. This is why Planck saw the quanta as being fixed energy levels where electrons could be found, but never in between. 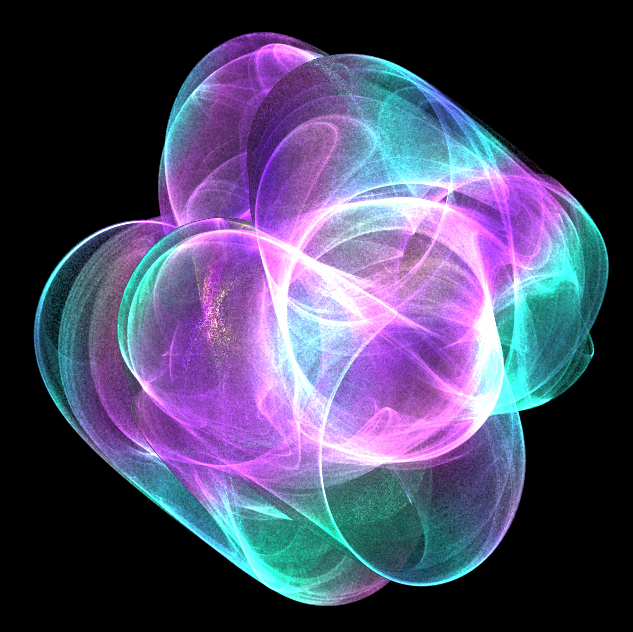 Another way of looking at subatomic particles (and all matter for that matter) is that they are crystallized or frozen energy; chaotic energy patterns are trapped in a lattice or matrix of quantum numbers. I am again reminded of the patterns I see in fractal math or chaotic geometry. The atoms freeze the energy patterns, but using particle accelerators, we force the particles into phase transitions and release the trapped energy, which soon re-freezes into other particles. The more energy we can add through our collider, the more massive the subsequent collision debris will be. 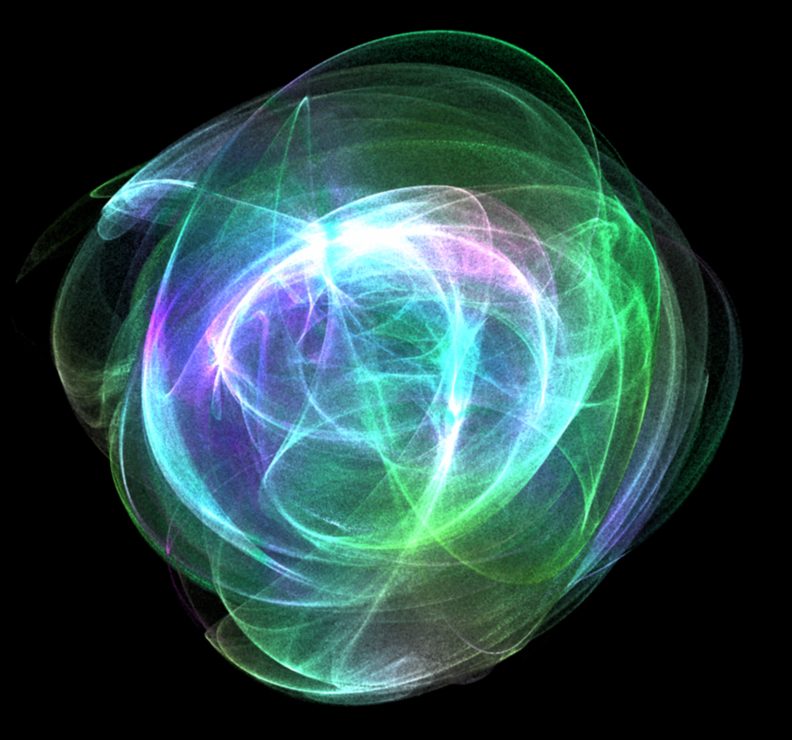 The dance of energy at the heart of matter is elegant and beautiful.